In the month leading up to the release of second edition Advanced Fighting Fantasy, I'll be writing about roleplaying in Fighting Fantasy. This first post will be about the previous role playing books and sourcebooks for Fighitng Fantasy. Then I will focus on my wishlist for changes to the Advanced Fighting Fantasy system. I did not come across Fighting Fantasy role playing until a few years after I had bought my first Fighting Fantasy book and since, when I was 11, I never looked at the years that books were published, I just assumed that the role playing game was natural evolution from lots of solo gamebooks. 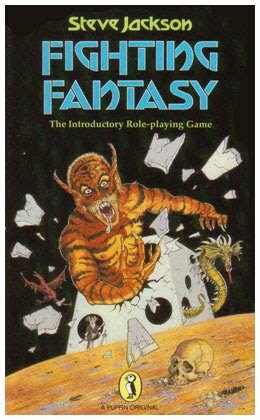 However, I have only just realised that the first Fighting Fantasy role playing game, Fighting Fantasy - The Introductory Role Playing Game, was published in 1984 when the solo gamebook series contained only ten books. The rules did not expand on solo Fighting Fantasy very much. The adventurers' characteristics were skill, stamina and luck and most situations were determined by either a test against skill, test against luck or by the games master determining what the chances of something happening out of 6. There are two adventures in the book, The Wishing Well and the longer Shaggradd's Hives of Peril. Both of them are dungeon crawls through a mish mash of illogical encounters. However, some thought has been put into making them interesting. For example, there is a room in Shaggradd's hive where if you say that something will happen, then it will happen. There is also an endless tunnel in the wishing well and a trap which makes zombies appear out of thin air. 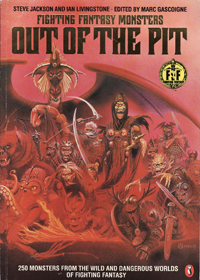 The first Fighting Fantasy role playing book did not add a great deal to Fighitng Fantasy, but it did start the ball rolling. 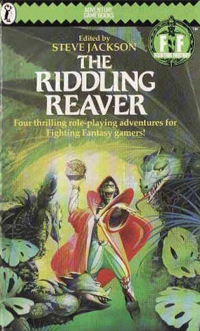 In 1986, another role playing book, The Riddling Reaver was published. In terms of rules, the Riddling Reaver added more to the basic Fighitng Fantasy system. It added variable damage for weapons, unconsciousness ( a hero is now unconscious when their stamina reaches 0, mortally wounded if their stamina reaches -1 which means that they can be revived with potions or spells and they only die when their stamina reaches -2), mighty strike (when a character rolls a double 6 for their attack strength, they automatically reduce their opponent's stamina to -1) and magic. One character was allowed to cast the spells from Citadel of Chaos, but their skill was 1d6 + 4 rather than 1d6 + 6 and their stamina was 14, the minimum. Spellcasting was not guarented to work. If they roll higher than their magic score on three dice then their spell will fail or misfire, depending on the gamemasters's (GM's) decision. The adventurers are also set up differently - they terms used are scenes and acts as if the players are in a film. There are four scenes in the Riddling Reaver, each one in a different location and with a different aim. The encounters are varied but more logical (well as far as the Rever's mind is logical) and builds up to a climax where the heroes somehow have to fight their way through a huge army of jelly coated skeletons (known as replicanths) in order to stop the Reaver destroying the pendulum of fate and disrupting the balance of good and evil. I never had a group to play it with, but my plan would have involved the beserk armour machine. That would have made short work of the replicanths. but you never expected this. In 1985, a sourcebook was published. This was called Out of the Pit and it contained details of 250 monsters which could be encountered in Titan. I enjoyed reading the entries about the monsters. I also enjoyed getting the additional information in terms of their intelligence, numbers and where you would find them. It was a nice monster manual. 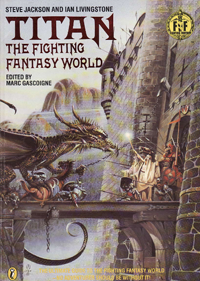 In 1986, Titan - The Fighting Fantasy World was published which told many stories of the history of Titan and some of its bigger personalities such as Lord Azzur, Nicodemus, The Healer, Yaztromo and the Demonic Three. I enjoyed reading these stories as they gave me material to work on my own stories in the Fighting Fantasy world. along with nice details such as festivals, drinks, prices and how to travel around Titan. It really fleshed out the world of Fighting Fantasy. 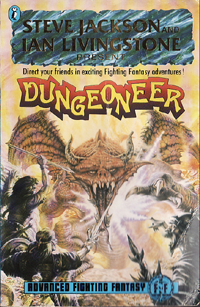 There were no more books to do with the fighting Fantasy role playing game, but in 1989, the first Advanced Fighting Fantasy book, Dungeoneer was published. It contains many new rules - the introduction of special skills, new spells that use stamina and also a more detailed description of many situations. It also contains two adventures presented as movies where the gamesmaster is now the director and the adventure is split into scenes. It is easy to tell that the rules from the Riddling Reaver were a prototype for this new system. I enjoyed the light hearted way that the adventures and rules were presented. 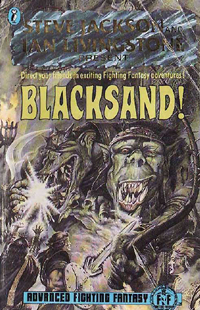 In 1990, Blacksand! was published which expanded on the rules of Dungeoneer with new skills, minor magic, priest magic and city generation tables. It also describes many people and locations in the city of Blacksand and ends with a new adventure. 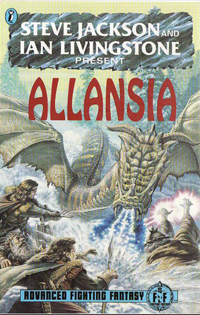 Then, in 1994, Allansia was released which, as well as new skills and new spells, it included rules on surviving and travelling in the different outdoor environments in Allansia. I love all of the books, but the Advanced Fighting system has a few big flaws and I will highlight these in my next few posts in the lead up to the release of Advanced Fighting Fantasy 2nd edition. An extra point that really stands out to me, and I think should be underlined, in the FF RPG is the lack of missile weapons. Gritty hand-to-hand only! Thanks for the comment, Billiam. I had not thought about missile weapons. I don't think that they were covered in Riddling Reaver either. I liked to Reaver as it was quite basic but not super basic. I think the basic RPG needed something for the heroes to differentiate themselves more. Thanks for your comment Elizabeth! The imagination is the bit we really need to role play. The games just give it some framework.